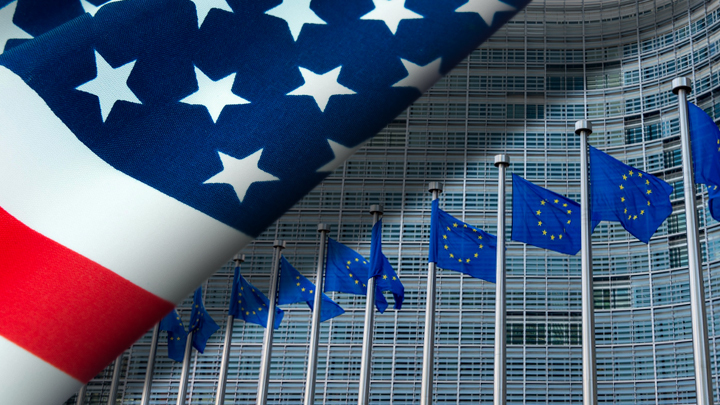 The European Union is annoyed at the lower level of diplomatic relations with the United States. “We are currently discussing with the US administration possible implications for the EU delegation in Washington,” said European Commission spokeswoman Maya Kosyancic. The discontent of the European Union is due to the fact that the White House no longer equates the EU with the nation-state, as was the case under former American President Barack Obama. For Trump, the European Union is just an international organization, just like the African Union. As Washington now refers to Brussels, it became clear at the funeral of George Bush Sr. on December 5 last year. In the guest list, the EU Ambassador David O’Sullivan was not in alphabetical order, as ambassadors of ordinary countries, but at the very end. It is curious that the White House did not officially announce the lowering of the status of the EU. However implicitly, Trump makes it clear that he does not respect the European Union. The position of Washington was previously voiced by the US ambassador to the EU Gordon Sondland. He called the European Commission an archaic and outdated structure that is “divorced from reality” and deals with the regulation of what is not needed. For the European Union, the issue of international recognition is fundamental, because the EU is different from traditional international organizations, such as ASEAN, NAFTA or the African Union. The EU has its own court, a single legal field, the institution of citizenship, the euro currency, the parliament and the executive bodies represented by the European Commission and the Council of the EU. If you leave the language of diplomacy, then the American president has very specific reasons to put pressure on the European Union. Trump is unhappy that Europe exports too much to the USA and creates for them a trade deficit of more than 100 billion dollars. To patch this hole, the White House introduced trade duties against imports of aluminum and steel from the EU, and also threatens to set tariffs on European cars. Another “bone of contention” is that Europeans spend little on defense, which is why the entire burden of NATO lies on the United States. Trump requires a minimum of 2% of GDP, up to this figure fall short of only the United Kingdom, Poland, Greece and Estonia. Not only do Europeans save on the US, they are also going to create their own army, as French President Emmanuel Macron said at the end of the year. Thirdly, the EU does not support the US on international issues, for example, in the sanctions against Iran or Palestine. Brussels criticized Washington’s withdrawal from the Iranian nuclear deal in May and agreed with Russia to create a workaround. In the Palestinian problem, the EU opposed the transfer of the American embassy to Jerusalem, which, according to European bureaucrats, breaks the solution to the crisis within the framework of the "two states" principle. Europe is also increasing its dependence on Russian gas. Trump would like Old World to buy American liquefied natural gas instead of laying the Nord Stream-2. But Angela Merkel made it clear that the Russian gas pipeline will be built, whether Washington likes it or not. The European Union will not only not respond, but is also ready to turn the second cheek under attack. While Brussels continues to suffer humiliation from the United States, Americans will behave like “occupiers,” as Gerhard Schroeder, the former German chancellor, openly said. With its Iranian sanctions, Washington has already caused Europe damage in the amount of several billion euros. Under the penalty of monetary fines, the largest European concerns left Total: Peugeot, Deutsche Telekom, Deutsche Bahn, Daimler and others. The same thing can happen if the Nord Stream 2 comes under US sanctions. Then the losses will be incurred by the French Engie, the Anglo-Dutch Shell, the Austrian OMV and the German Winterschall and Uniper. In this situation, the only way out for the European Union is to turn to Moscow and strengthen contacts with Beijing. Otherwise, the White House will continue to spit on Europe and wipe its feet on it.